On hearing of a strike by nurses demanding better staffing levels at Europe’s largest hospital, Charité, in Berlin last July a junior doctor in London said “They should do that here”. Now the junior doctors are striking here in England in a dispute over a contract that involves both a pay cut and problems of staffing levels. The government claim that they have offered a pay rise, but it’s one which will leave doctors thousands of pounds worse off due to a cut in out of hours pay. The claim that this is about 7 day working is equally outrageous, when the junior doctors have always covered nights and weekends, and rightly fear that increasing the weekend workload without increasing the number of staff would put patients at risk. In February secretary of state for Health, Jeremy Hunt, announced that the new contract would be imposed from August as negotiations had broken down. 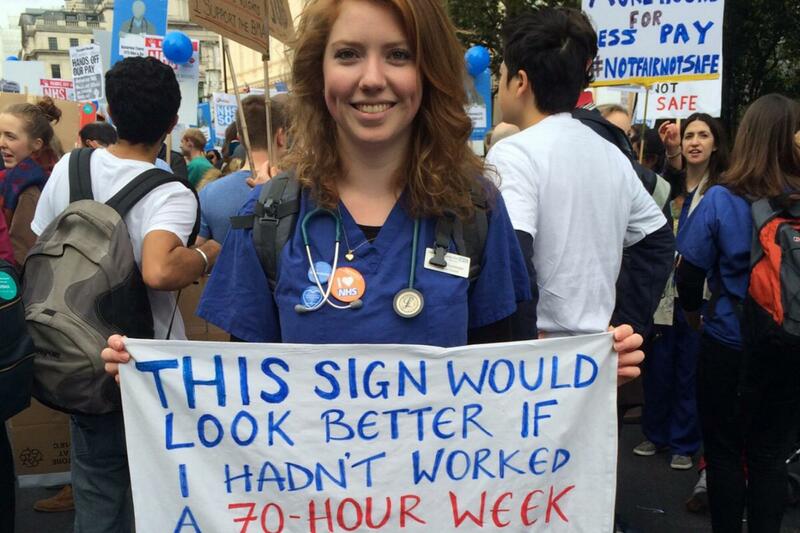 The question facing junior doctors now, as with any sector of workers, is how to struggle. The BMA has escalated strike action from one day to two days in March and again on 6-8 April, and on 26-28 April will call an 18 hour strike without emergency cover – emergencies will be seen by other doctors. It is also launching a judicial review of the government decision on the contract – junior doctors have raised tens of thousands of pounds for this. The problem here is that judicial review is clearly not an action that workers take collectively, but an appeal by citizens to the state and in the case of ongoing strike action nothing but a sideshow, a distraction to make it appear the BMA is doing something for junior doctors. Strike action, on the other hand, is the classical weapon of working class struggle and the plan to withdraw emergency cover sounds really militant – although other BMA members will be covering. Nevertheless, the strikes are protest strikes in support of union negotiation, with the BMA website at pains to explain who may and may not join the strike, insisting that participation in the strike is an individual decision, and laying out how to picket legally (a maximum of 6) with a view to public support. And the rules on who can strike are indeed byzantine. If teachers have faced a situation where those in one union are told to cross a picket line of those in another, there are some doctors in the position of being told they can strike on Wednesday 6th, when they are formally employed by the NHS, but not on Thurs 7th when part of the same job is formally for Public Health England, for instance. Here we can see the BMA is doing its best to rob the strike action of all collective solidarity and turn it into another protest by citizens. Is this because junior doctors, however highly educated, are very inexperienced in class struggle? Last time they struck in 1975 the overwhelming majority were destined for a petty bourgeois position either as GPs running a small business or consultants with a private practice. After 40 years of pressure on NHS costs that is no longer the case, and while some will find more scope for business as NHS providers, or in the NHS bureaucracy, or both, others will be salaried workers. In this situation their union, the BMA, prides itself on representing all doctors whether employees or employers. Whatever is unusual about the BMA, it is containing this struggle just like any other union. Calling workers out on strike for one or 2 days now and then as a demonstration to support or demand negotiation has been typical of struggles in the recent past, such as the electricians in 2011-12 or the teachers’ strike over pensions on 28 March 2012; and before that the CWU used exactly the same tactic with postal workers. It is a tactic that gives the unions great control, even at the expense of anger by the workers and in spite of the efforts they make to break out of this control. For instance when electricians and students held separate demonstrations on the same day a large group of electricians tried to get through to link up with the students instead of marching tamely off to Parliament. They were kettled and blocked. Similarly, while most unions would not emphasise that striking is an individual decision they achieve the same thing by emphasising the need to obey the law on picketing. So to struggle as part of the working class, rather than just being a bit of walk-on street theatre, means to come up against the unions. And as the electricians’ demonstration showed, if the unions cannot maintain control and keep them isolated, the police will be there to do it for them. The electricians who tried to get through to link up with a student demonstration showed another aspect of what it means to struggle as part of the working class – solidarity with other sectors, linking up with them, because their struggle is our struggle. When workers are isolated, as electricians, as postal workers, as junior doctors, they are very weak – even the massive and very militant miners’ strike in 1984-5 was fatally weakened by being isolated in one sector. Strikes that spread across many sectors – France in 1968, Poland in 1980 – were much more powerful. The question of extending a struggle to link up with other workers is not just a useful tactic; it goes to the heart of what the working class is as the class that collectively produces in capitalism. And it is illegal. So a good citizen may withdraw his or her labour from a particular boss with whom there is a contract of employment, but may not legally try to extend that struggle to others who are equally affected by the dispute. Workers in Port Talbot are not the only ones who are affected by the decisions of Tata Steel: a much greater number of workers in the supply chain also find their jobs at risk because they are all associated in various aspects of the production of goods that goes far wider than even a huge multinational. This is the basis for the working class, when it sees itself as a class, to develop the power of solidarity, and also to develop a perspective for society as a whole which is in total contradiction with capitalism’s war of each against all. Going back to the example of the junior doctors, their dispute has an impact on all those who rely on the health service, which is recognised but distorted in the totally false ideology of defending the NHS. So we have seen pickets with posters “hoot if you heart the NHS”, as we have in many struggles in the health service, just as the miners called for support to British coal. It is a trap that keeps workers tied to their employer, their sector, their isolation from other workers. And it is clearly not true. Striking health service workers do not love the NHS, they are on strike against it because they are being exploited by it. What they ‘love’ is not the real NHS with all the cuts and cost savings, but the idea of a health service that gives them adequate resources to look after patients well and do a job they love. There is no perspective for such a health service in capitalism.